a. ^ Kuala Lumpur is the capital city and is home to the legislative branch of the Federal government. Putrajaya is the primary seat of the federal government where the executive and judicial branches are located. b. 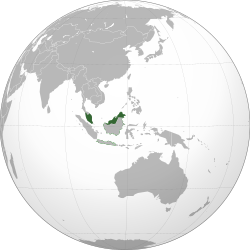 ^ The terminology as per government policy is Bahasa Malaysia (literally "Malaysian language") but legislation continues to refer to the official language as Bahasa Melayu (literally "Malay language"). c. ^ Under the National Language Act 1967, "The script of the national language shall be the Rumi [Latin] script: provided that this shall not prohibit the use of the Malay script, more commonly known as the Jawi script, of the national language." d. ^ Under the National Language Act 1967, English may be used for some purposes. e. ^ Before the accession, Sabah was referred to as North Borneo. f. ^ Singapore became an independent country on 9 August 1965. തെക്കുകിഴക്കൻ ഏഷ്യയിലുള്ള രാജ്യമാണ് മലേഷ്യ. പതിമൂന്നു സംസ്ഥാനങ്ങൾ ചേർന്ന ഫെഡറേഷനാണിത്. തെക്കൻ ചൈന കടലിനാൽ മലേഷ്യ ഭൂമിശാസ്ത്രപരമായി രണ്ടായി വിഭജിക്കപ്പെട്ടിരിക്കുന്നു. തായ്‌ലൻഡിനോടും സിംഗപൂരിനോടും അതിർത്തി പങ്കിടുന്ന മലേഷ്യൻ ഉപദ്വീപാണ് ഒരു ഭാഗം. ബോർണിയോ ദ്വീപിലാണ് രണ്ടാമത്തെ ഭാഗം. ഇവിടെ ഇന്തോനേഷ്യ, ബ്രൂണൈ എന്നീ രാജ്യങ്ങളുമായി അതിർത്തി പങ്കിടുന്നു. തായ്‌പെയ് 101 എന്ന കെട്ടിടം വരുന്നതുവരെ ലോകത്തിലെ ഏറ്റവും ഉയരം കൂടിയ കെട്ടിടം എന്ന ബഹുമതി നേടിയ പെട്രോണാസ് ഇരട്ട ഗോപുരങ്ങൾ മലേഷ്യയിലെ കൊലാംലം‌പൂരിലാണ്‌ സ്ഥിതി ചെയ്യുന്നത്. എങ്കിലും ലോകത്തിലെ ഏറ്റവും ഉയരം കൂടിയ ഇരട്ടഗോപുരം എന്ന ബഹുമതി ഈ കെട്ടിടത്തിനാണ്‌. ↑ Section 9 of the National Language Act 1963/67 states that "The script of the national language shall be the Rumi script: provided that this shall not prohibit the use of the Malay script, more commonly known as the Jawi script, of the national language". ↑ Section 2 of the National Language Act 1963/67 states that "Save as provided in this Act and subject to the safeguards contained in Article 152(1) of the Constitution relating to any other language and the language of any other community in Malaysia the national language shall be used for official purposes". ↑ 3.0 3.1 See Article 152 of the Federal Constitution of Malaysia and National Language Act 1963/67. ↑ "Malaysia". CIA. ശേഖരിച്ചത്: 26 October 2010. ↑ "MALAYA: Independence by 1957". Time. 20 February 1956. ശേഖരിച്ചത്: 22 April 2012. ↑ "Numerous Events Organised For Sarawak Independence Celebration". Chief Minister's Department of Sarawak. 28 March 2013. ശേഖരിച്ചത്: 28 May 2013. ↑ Frans Welman. Borneo Trilogy Volume 1: Sabah. Booksmango. pp. 159–. ISBN 978-616-245-078-5. ശേഖരിച്ചത്: 28 May 2013. ↑ "Taburan Penduduk dan Ciri-ciri Asas Demografi" (PDF). Jabatan Perangkaan Malaysia. p. 82. ശേഖരിച്ചത്: 4 October 2011. ↑ 7.0 7.1 7.2 7.3 "Malaysia". International Monetary Fund. ശേഖരിച്ചത്: 23 January 2013. ↑ "Delegation of the مليسيا domain representing Malaysia in Arabic". Internet Assigned Numbers Authority. ശേഖരിച്ചത്: 16 June 2013. ↑ Wong Chun Wai; Edwards, Audrey (4 June 2007). "Back to Bahasa Malaysia". The Star. ശേഖരിച്ചത്: 26 October 2010. ഈ താൾ അവസാനം തിരുത്തപ്പെട്ടത്: 02:41, 6 ഏപ്രിൽ 2019.